The Kenmore HE2t 3.7 washer has a stain treat option that will heat up the water in your washer slowly which will remove the different stains in your load of laundry. The capacity of the machine will allow you to wash up to twenty bath towels in one load. This large capacity size will allow you to get through your laundry in a much shorter period of time. An Energy Star appliance, this washer will give you a savings on your electric and water bills from the very first day you begin to use it for your family. Not only does this save money on your bills, but if you are concerned about the environment, saving energy and water is a way to protect and save our natural resources. The savings that can be realized from this machine is seventy two percent of the energy and sixty nine percent of the water that is usually used in a normal wash cycle of conventional washing machines. This Kenmore machine works with a Catalyst Cleaning agent which saturates the clothing in your laundry with a specially designed concentration of laundry detergent. • Large capacity machine allows you to save time and energy on your laundry time. • Advanced technology cleaning system which will eliminate multiple stains in one wash load. • Catalyst Cleaning agent cleans laundry with a special innovation in the dispensing of detergent. • Quiet and efficient to run even when the machine is in the next room. • Machine has had repair problems for some users. • Some complainers find a problem with cleaning capacity of the machine with the low level of water. The Kenmore HE2t 3.7 washer is a large capacity machine that is a good choice for families with large amounts of laundry. The digital panel is easy to use and proves to be a well designed feature of the machine. There are custom settings on the machine that will you create the wash cycle that you need. The spin cycle is very effective and will leave the clothes less wet which will decrease the amount of time that is needed in the dryer. This Kenmore washer is a front loading machine which may require some getting used to. Kenmore is a high quality name in washers and home appliances. Many of their customers return again and again to buy the items for their home. A Kenmore washer should expect to have a life of ten to fifteen years making this machine a good value for the money. Individual results may vary, but overall these washers are built to last. The machine is reasonably priced when you consider the life of the machine and the energy savings that you will get with this machine. A great value for your money that should last in your home for many years. The machine is a front loader so make sure that you can accommodate this in your home. I have a repair scheduled for Tuesday, and hate to pay the repair fee of $85.00 IF this IS totally normal. Can anyone verify that this water under the drum is truly the norm? Why did I not notice this water before? I have owned the HE2T for 5 years(only used the machine for 4) and it has stopped working on the spin cycle. $100+ to have Sears come and look at it and then who knows what the repair cost will be. Sears is a sad excuse for a company. I'm suprised they're still in business. I'll never shop at Sears again, it's just not worth it, on any level. Can I use only cold water to wash my clothes in my front loading automatic washer? I have trouble lately, the door won't open and maybe it's because I always wash in cold water to save energie. Bought this machine in 2008, before the first year was up we had to replace the door seal and it now makes a clunking noise, door gets water in it and leaks on floor and does not finish the wash cycle it turns off after fifteen minutes and you need to put it on the rinse cycle to drain and spin it. For a three year old machine it sure needs a lot of repairs, not worth fixing, need to buy a new machine. Will not buy a front loading machine again, we were told they are costly to fix and break down more. Bought the machine in 2006 and it has been fine. Two weeks ago (beginning November 2011) the washer errored out and I could not open the door. Played with the controls and got the "Add a Garment light to come on, quickly grabbed the door and it opened. Thought this was a momentary glitch. Today (11/19/2011) the same thing happened. "Add a Garment" light on but door will not open. Scheduled repair, earliest appointment 2 weeks from now. Clothes will be moldy and rotten by then. Went to tech support. Couldn't help me after 20 minutes for so, sent me to customer service. Couldn't help me after 20 minutes or so, back to tech support. This fellow stuck to his answers not matter what. Unplug for 10 minutes, door will automatically open. NOT SO. Put on shortest cycle, "Rinse, Drain, Spin" and it will work through the load. He was undeterred in his answer in spite of the fact that I mentioned it has stopped and done nothing in the middle of a cycle, when I turned it on it just sat there with its lights on and did nothing. He came back with letting it work through a cycle. Anyone know how to get this door open?? I bought my Kenmore HE 2t in September 2009; the machine has been leaking out through the door for over a year. It now has error message after error message, and I have to unplug it to clear it. That use to work not anymore. It does not drain water during the spin cyle, and when I try to just spin it out, it still does not work and it will not unlock the door. I paid a lot of money for the washer and dryer. I could have bought a new set for what I paid for the washer alone. I will never buy another KENMORE appliance. PIECE OF JUNK!!!!! I have had a front loading washer (White Westinghouse). It lasted 17 years. Never had a service call. For two years, this machine was disappointingly ho hum. Then it up and quite working. Like everyone else here, I called Sears. They now want $109 just to cross my threshold. For $350 they'll come back for any additional repairs for 12 months, which shows no confidence in the washer or the repair tech's skills. Also, if I'm paying a hundred bucks to get you to my house, I'm going to need you there in sooner than six days time. Will NEVER buy another Kenmore or Whirlpool product and will NEVER EVER shop at Sears again. If you have one of these washers, I'm sorry. If you don't, save yourself the grief. Kenmore HE 2t is a piece of junk. My wife and I bought a Kenmore HE 2t front loading washer in February 2008 and on May 28, 2009 it started a loud screeching noice. The door leaks. We shut it down immediately! 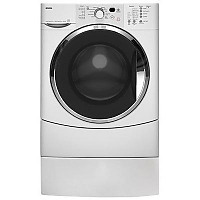 We did not get the warranty because I was told by a Sears saleswoman that these washers last about 18 years to 20 years and I personally feel if a big ticket product can not last, at least 3 years, then I do not want that product. Live and learn. I called the Sears customer service number and was told it would cost $75.00 to have a repairman come out and look at it and that fee would not go towards the cost of repair. That,s not going to happen. If it was included in the repear, we would consider it. I called a private repair service to come out and look at it and was told it is probably is a bearing and will cost about $350.00 to 450.00 to fix. His advice was to dump it and buy a top loader. The front loaders are "no good" and expensive to fix. This was not a Sears man but a well recognised repear person it the Downriver area. I am so mad at Sears for selling me a piece of junk like this. We used to buy ALL of our appliances at Sears. That has changed. We have been taking our laundry to the Laundry mat ever since. I bought this washer just 1.5 years ago and it started giving me error messages and wouldn't drain. I think the hose has something clogged in it. You would think that you pay $1000 for an appliance that it would at least last you for 3 years, but no that's not the case with this piece of garbage. Now I have to pay some Sears technician $80 just to tell me what the problem is. Kenmore is a unscrupulous bunch of crooks that have a deal with Sears. We'll make products that work for only a year and then your repair men will employed forever. I will never buy from Sears or Kenmore again, both of you are pieces of garbage who do not know the meaning of craftmanship or customer service. Please all you out there do not buy this washer. This washer worked well for 18 months. Then started getting error signals regularly. Spent $600 on repairs and it still doesn't work. It gets jammed up about 50% of the time I use it and often takes days to get the error codes cleared. I am currently on line searching for a new machine - this is a piece of junk. DO NOT BUY! Even though I have used very little detergent (always HE) and extra rinses, this machine does not remove the soap properly. This is my second front loader and I am NOT happy with it. Also, the length of the programs is ridiculous. TWO HOURS for whites and heavy duty loads and 26 minutes for an additional rinse! This frontloader worked fine for about a year. Since then it fails to spin dry about 1/2 the time. I have had this machine for over 3years. just after the 90 days It wouldn't drain.It error code said I had to much soap. Then I tried another load. Same thing. I ended up doing work on it. I opened the bottom and found the water pump. I opened the drain and found 2 pair of my childrens socks in the filter. I have no idea how they got there. Now every 3 months I have to open it up just incase there is some thing there. I also had to replace the dispenser hose on my own since sears was going to charge me $200 to come out and do it. Ended up paying $20 for the hose. They said that it wasnt covered under warranty. which was wierd since it was a defect it came with. Over all I love my washer just have to pray everytime I use it so it dont quit on me. I sell appliances for a competitor and none of them match this machine, for those who say the soap does not come out of the wash are probably cheaping out and not using He soap. I own a sears HE2T washer from sears.After about 3 months called service dept because washer was leaving stains on the clothes. The stains were soap stains and would come out usually in a second wash.They told us we were using to much detergent,so we cut back on the detergent still the same.